Last year's Liberty Festival. Photo by Greater London Authority on Flickr. On Saturday 30 August Mayor of London's Liberty Festival celebrates the talent and strength of deaf and disabled artists. 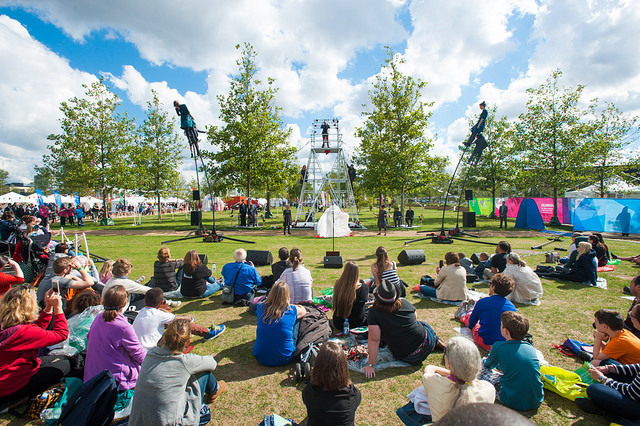 As part of the National Paralympic Day, the festival takes place in the newly opened South Park Plaza, part of The Queen Elizabeth Olympic Park. Alongside the ParalympicsGB sport competitions, everyone is welcome to enjoy loads of free and fun outdoor activities, whether you have a disability or not. The line-up of events includes music, theatre performances, film screenings and lots to do for families. Start your day with a sensorial experience and try Gift: artist and composer Jez Colborn has transformed a giant shipping container into a musical instrument and performance arena. Then how about some music? The line-up includes solo singer Louise Rutkowski, band Paul Hawkins & Thee awkward Silences and blind musical prodigy Derek Paravicini. One of the hottest performances will be the combination of aerialist Paul Evans and visually impaired singer and acrobat Amelia Cavallo. There's something for cinema-lovers too: enjoy a selection of films curated by Carousel's Oska Bright or listen to artists from the Drake Music Project playing a live electro soundtrack to a sci-fi short film, in association with the BFI. Newham-based organisation Together 2012! also presents a community programme of film and performances. Children's shows include the non-verbal interactive play Snooks Brothers Aquatic by Hi-jinx Theatre and the aerial piece Lovely Bugs, performed by Rachel Freeman and Everybody Dance. The whole family can discover the park with Eye Queue Hear: this audio-tour performance by Access all Areas uses headphones adapted especially for the Olympic Park. Everyone can try out Paralympic sports during the day and attend Q&A and autograph sessions with Paralympic medallists, too. The festival's aim is to celebrate the accessibility of sport for everyone and the legacy of London's 2012 Olympic Games. All the associations involved in the programme also promote the involvement in the arts for people with learning disabilities. The Liberty Festival 2014 is part of National Paralympic Day and takes place on Saturday 30 August at Queen Elizabeth Olympic Park in Stratford, London E20 2ST. Entrance to the event is free throughout the day.